According to a recent study by CardWeb.com,The average household in America with one or more credit cards has nearly $11,000 in credit-card debt. A recent study shows that a percentage of Americans admitted of having at least 1 or more credit cards in their wallets and would use them for their everyday expenses. As the economy continues to say fragile experts are advising people not to use credit cards to pay for things they consume quickly, such as meals and vacations, especially if they can’t afford to pay off the monthly bill in full within the interest free period. 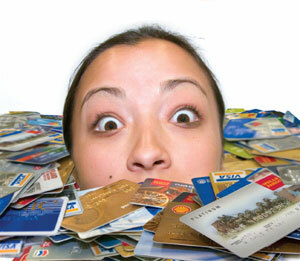 Unaffordable credit card debt is resulting in many people looking for a solution to their debt problems. If you’ve lost a job or your monthly payments are unmanageable, you should call your credit card company before you miss the first payment. Your lender might be more willing to work with you. Ask if there is any possibility that you can get your interest rate lowered or try to work out a payment schedule for your debt. Many consumers were able to erase credit card debt this way, when before, they were struggling endlessly with their monthly payments. If you want to consolidate your credit card debt, you should first look at all of your debt and work out a plan. Once you know what you owe, you can get accurate advice on your situation. If you use a credit consolidation company or a credit card debt relief service, don’t be afraid to tell them you are looking around for the best deal. If you’re 90 days or more delinquent on your credit card balance and there’s little hope of paying off your card, your lender may offer to settle your balance for a lower amount or freeze the interest on your balance. Make sure you call your lender and ask about this option. It’s unlikely that most of your credit card debt will be wiped away but you may be able to come to a reasonable arrangement. You should bare in mind that if you do settle some of your debt, it will probably be reported to the credit bureaus as a settlement which could hurt your credit score.